Benjamin Grimshaw was born in 1856 in Oswaldtwistle, Lancashire to Henry and Mary (Fielding) Grimshaw. His parents were Henry and Mary (Fielding) Grimshaw. His father died before he was five years old. He and Annie Marsh (who was born in Accrington) were married in Haslingden in 1882 and had two children, Mary (born June 1884) and Henry Ewart (born July 29, 1890) Grimshaw, both in England. 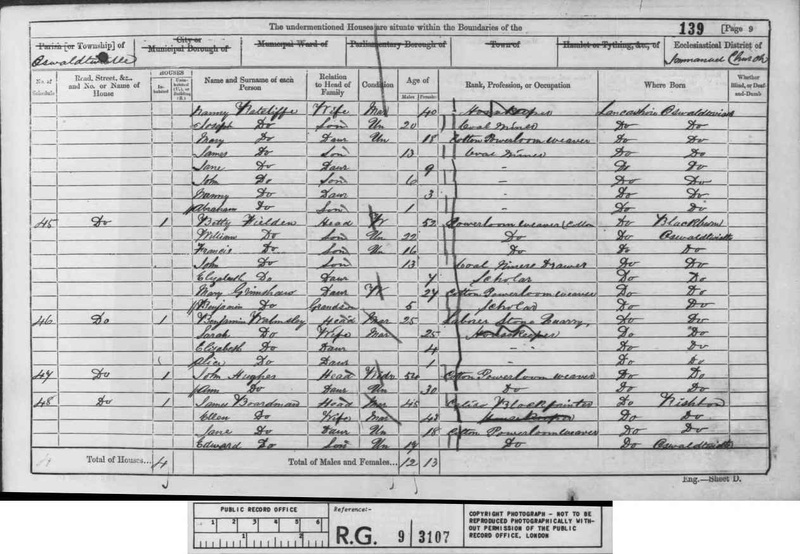 The 1891 UK census found Benjamin and Annie Grimshaw living in Accrington with their two children. 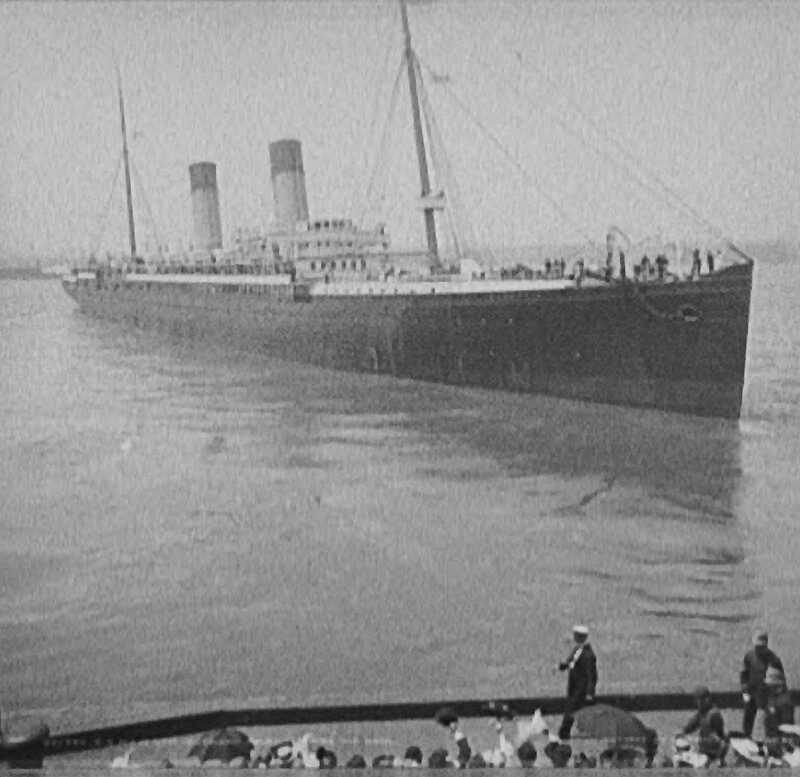 In 1895, the family emigrated to New York, arriving at the Port of New York on the Majestic on September 11. Henry Ewart Grimshaw married Ruth Dubocq and the couple had two children, Robert and Ruth Grimshaw. Henry, a subject of a companionwebpage, attended Columbia University, where he wrote a masters thesis entitled, “Hand-loom Weavers in England during the First Half o the Nineteenth Century”. Henry then taught high school in New York City and wrote at least two short history books. Thanks go to Susan Nass of “Random Acts of Genealogical Kindness for providing a great deal of information that made this webpage possible. Thans also to Laura (last name unknown) for providing information on this family line on Ancestry.com. Based on information provided below by Susan Nass, Laura (last name unknown), and other sources, the following descendant chart can be constructed on a preliminary basis. |—Mary Fielding (abt 1834 – ?) & Henry Grimshaw (unk – bef 1861). Married 8 Sep 1855, Oswaldtwistle. |—|—Benjamin W Grimshaw (20 Feb 1856, Oswaldtwistle, Lancashire – ?) & Annie Marsh (Aug 1858, Accrington – ?). Married 1882, Haslingden, Lancashire. 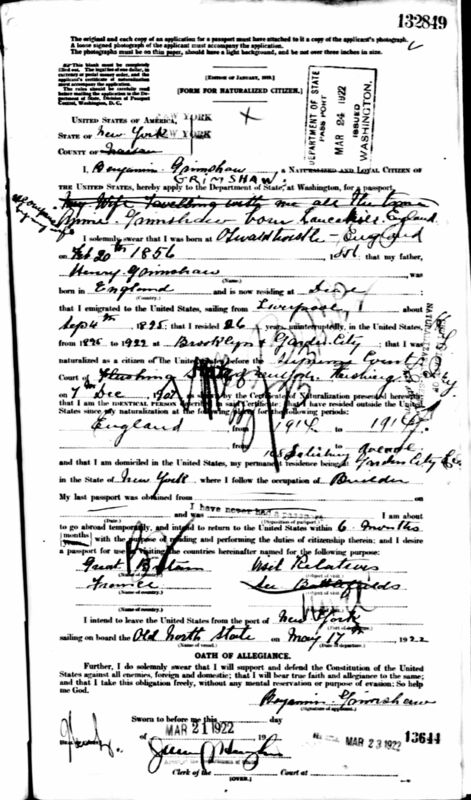 Benjamin and Annie (Marsh) Grimshaw arrived at the Port of New York on the Majestic on September 11, 1895 with their two children, Mary and Henry. Henry arrived in Quebec years later, when he was 24 years old, from Liverpool. Mary Grimshaw, married in 1855 and having had son Benjamin in February 1856, is already a widow in 1861. She and five-year-old Benjamin are living with her mother, Betty Fielden (Fielding) and her family. Betty is also a widow. Most adult members of the household are employed as cotton power loom weavers. 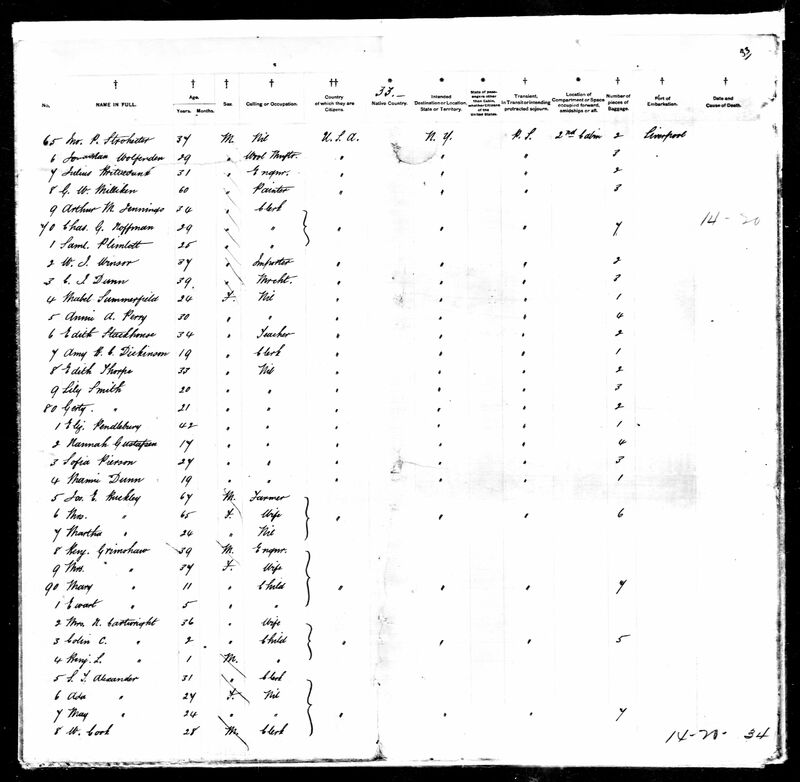 Original data: 1) Passenger Lists of Vessels Arriving at New York, New York, 1820-1897; (National Archives Microfilm Publication M237, 675 rolls); Records of the U.S. Customs Service, Record Group 36; National Archives, Washington, D.C. and 2) Passenger and Crew Lists of Vessels Arriving at New York, New York, 1897-1957; (National Archives Microfilm Publication T715, 8892 rolls); Records of the Immigration and Naturalization Service; National Archives, Washington, D.C. Description: This database is an index to the passenger lists of ships arriving from foreign ports at the port of New York from 1820-1957. 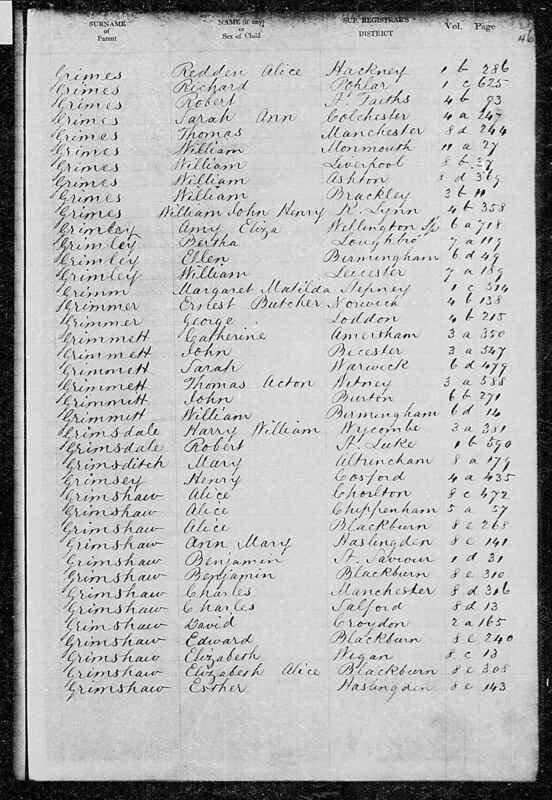 In addition, the names found in the index are linked to actual images of the passenger lists. Information contained in the index includes given name, surname, age, gender, arrival date, port of arrival, port of departure and ship name. Henry was born in London on July 29 1890 and was married to Ruth Grimshaw. The couple lived in Queens, New York, and Henry was employed at Boys High in Brooklyn at the time of his registration during World War II, about 1942. I am not related to this family in any way. Saw your post and this is what I have found. All information from www.ancestry.com (pay to view site) unless otherwise noted. Annie Grimshaw 33, wife, b.
Mary Grimshaw 6, daughter, b.
Mary Grimshaw 27, daughter, widow, powerloom weaver (cotton), b.
York; Roll: T623_1067; Page: 12A; Enumeration District: 518. Roll: T624_995; Page: 8B; Enumeration District: 1119; Image: 173. Roll: T625_1128; Page: 8A; Enumeration District: 44; Image: 419. 1601; Page: 9A; Enumeration District: 401; Image: 612.0.